The largest USB Flash Drives that most people are willing to buy today are 512GB, with USB 3.0 / USB 3.1 Gen 1. The top drive in this review comes in under $150, and two others are under $200. Our buying guide features: PNY Pro Elite, Patriot Supersonic Mega, Rage 2 and Magnum 2, as well as Corsair Flash Voyager and Kingston Digital HyperX Savage. For large capacity Flash Drives like these, we look for low-price, fast write, fast read and reliability. 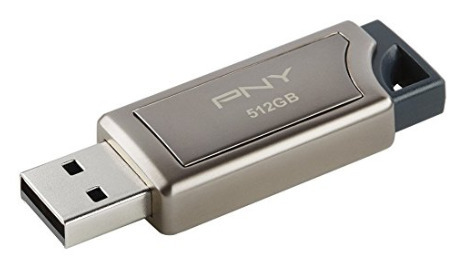 Our top pick is the PNY Pro Elite 512GB USB 3.0 Flash Drive ($140.75 / P-FD512PRO-GE). This “Premium” device is the most affordable 512GB Flash Drive we found from a name-brand manufacturer; It has excellent read and write speeds of 400MBps and 250MBps respectively. Our only negative is that due to some formatting and other functions, the actual available capacity for data storage is closer to 480GB than 512GB. The runner up for value is the Patriot 512GB Supersonic Mega USB 3.1/USB 3.0 Flash Drive ($164.99 / PEF512GSMGUSB). This is a USB 3.0 / 3.1 Gen. 1 compliant (backwards compatible with USB 3.0 and USB 2.0) device that has a tough industrial strength zinc alloy housing for shock resistance up to 15Gs. The Read speed of up to 380MB/s is good, but the Write speed of up to 70MB/s is the slowest of the drives on this list. For a little more money, the Patriot 512GB Supersonic Rage 2 Series USB 3.0/3.1 Flash Drive ($192.99 / PEF512GSR2USB) delivers on the speed. It’s a USB 3.0/3.1 Gen 1 rated for Reading up to 400MB/s and Writing up to 380MB/s. The rubber coated housing is a nice touch – protecting the drive from drops, spills, and daily abuse. If you prefer the aluminum casing, the Patriot 512GB Supersonic Magnum 2 USB 3.0 Flash Drive ($195.99 / PEF512GSMN2USB) is rated for shock resistance up to 15Gs, and good transfer rates: Read up to 400MB/s, Write up to 300MB/s. Crossing the $200 price line is the Corsair Flash Voyager GS 512GB USB 3.0 Flash Drive ( $267.64). The Corsair has a Max Sequential Read (CDM) up to 295MB/s and Max Sequential Write (CDM) up to 290MB/s housed in a zinc alloy body with aluminum accents. The Kingston Digital HyperX Savage 512GB USB 3.1/3.0 ($293.46) ends our list as the one of the most expensive 512GB devices, but also one of the most reliable. If you need a rugged, dependable drive than this may be worth the 2x price of our top pick from PNY.